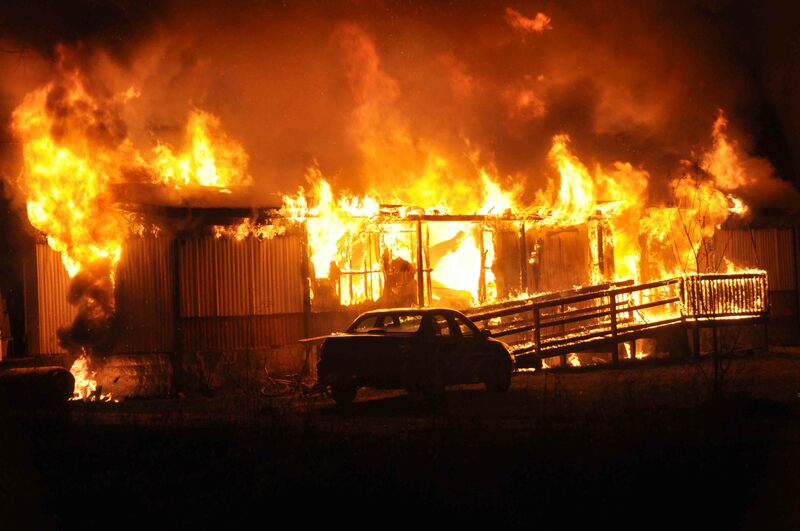 Early notification resulted in saving a large mobile home Thursday morning, 31-March. Firefighters were sent to 201 Mallard Lane at 00:12 reporting a possible fire in the kitchen of the residence. The 125 x 38 doublewide mobile home had multiple additions. The homeowner had a grease fire on the stove approximately 30 minutes earlier, damaging the stove and the kitchen cabinets. Click here for additional information. An early morning fire has displaced a Pynes Community family. 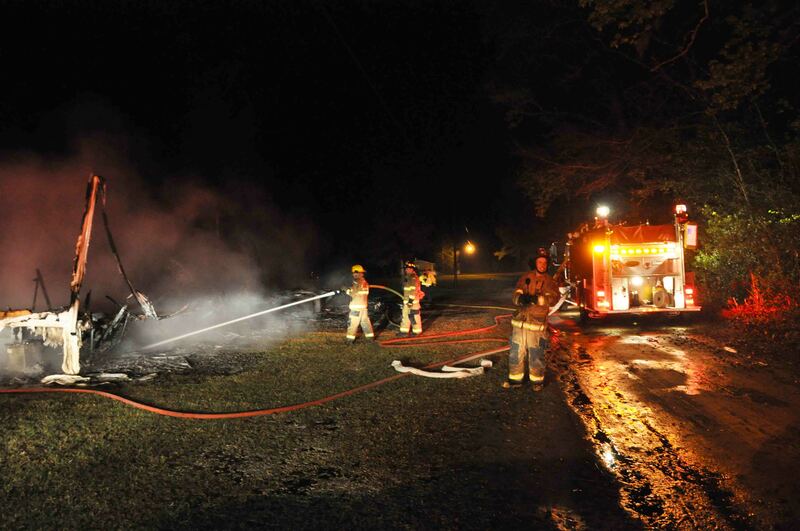 Firefighters responded to 161 Adrian Lane at 03:48 Sunday morning 27-March. Engine 6 and Medic 6 arrived to find the totally destroyed singlewide mobile home in ashes. Much of the fire had already burned out, leaving just the frame rails in ¾ of the building’s remains. Click here for additional information. A single vehicle accident sent two people to the Trauma Center Saturday afternoon, 26-March at 17:27. 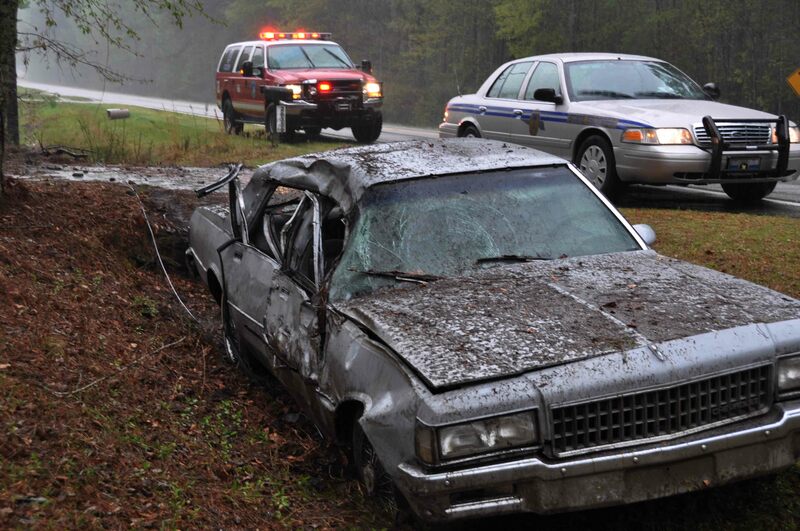 An older model Chevrolet Caprice left the roadway at a high rate of speed, entered a ditch before striking a utility pole, then impacted a driveway culvert. The car cleared the driveway, coming to rest in the ditch. Both occupants suffered multiple traumatic injuries, one with head trauma. Click here for additional information. 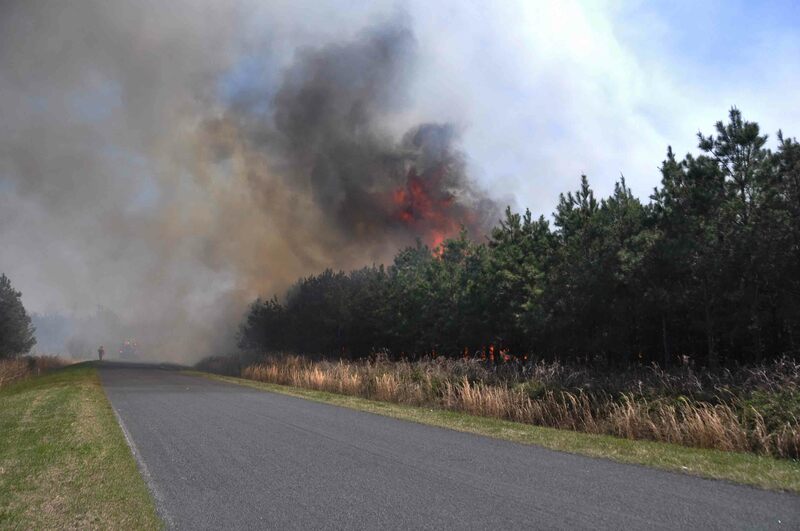 A rapidly spreading grass/woods fire in the Islandton Community was one of several woods fires that kept firefighters busy Thursday afternoon, 24-March. Units were dispatched at 13:52 to the 4000 block of Forks Road by a person reporting a large fire in the area. Engine 4 arrived to find an approximately 1-1/2 acre rapidly moving grass fire that was threatening one residence. Click here for additional information. 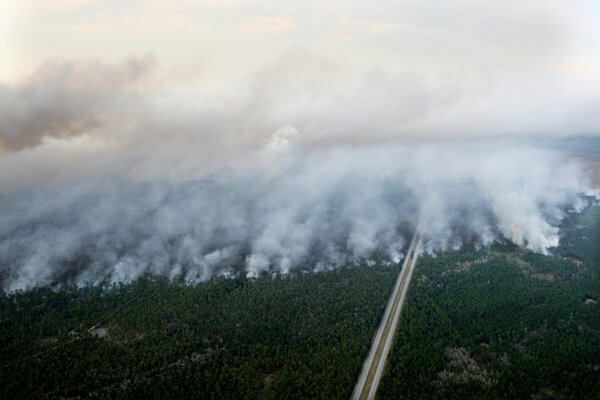 A small contingent of Colleton Firefighters with two pieces of apparatus, responded under the SC Firefighter’s Mobilization System to assist Charleston County and State Forestry Firefighters with the 1100 acre woods fire north of Awendaw/McCleanville in Charleston County. Local personnel were sent for a two day deployment, but worked only through the night.....click here for additional information. Engine 19 was dispatched to a woods fire in the 800 block of Benjamin Drive at 14:02, Wednesday 23-March. While responding the incident was upgraded to a structure fire. Low humidity, dry conditions and 15 to 20 mile per winds created bad conditions for Firefighters. Engine 19 arrived to find heavy smoke conditions and a fast moving woods fire. Click here for additional information. 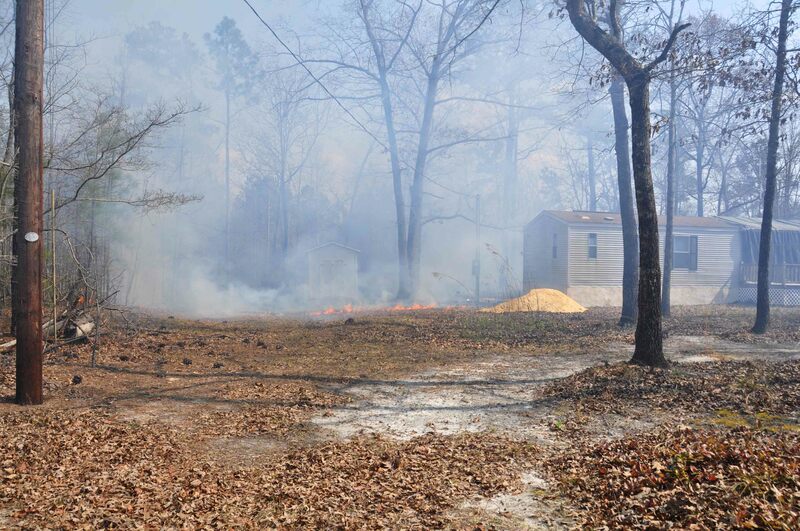 Engine 18 responded to a woods fire in the 10600 block of Bells Highway Wednesday afternoon 23-March at 13:49. They arrived to find a large rapidly moving woods/grass/field fire endangering multiple structures, vehicles, boats and farm equipment. A structural response was requested and dispatched to assist Engine 18. Six stations total responded along with the Forestry Commission. Click here for additional information. Medic 6 and Engine 7 responded to a woods fire in the 600 block of Proctor Street Tuesday afternoon 22-March at 15:14. Medic 6 was returning to quarters and was close to the scene when the incident was dispatched. They arrived about two minutes later to report a slow moving grass fire that had burned onto adjacent property and entered the woods. Click here for additional information. 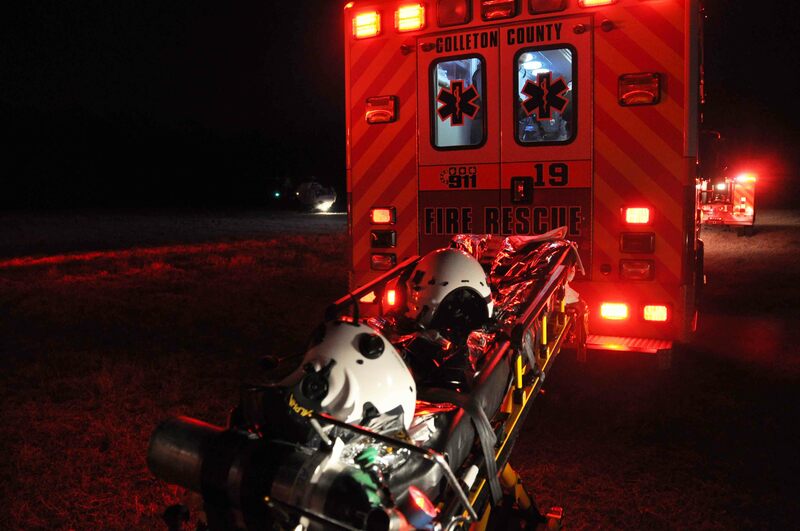 A single vehicle accident has sent two men to the hospital with traumatic injuries. The accident occurred on South Jefferies Blvd at Hampton Street in the City of Walterboro, just south of the Courthouse. The older model Chevrolet Pickup truck left the roadway and struck a large oak tree, resulting in heavy damage to the truck. The vehicle which was used in a building construction business...click here for additional information. 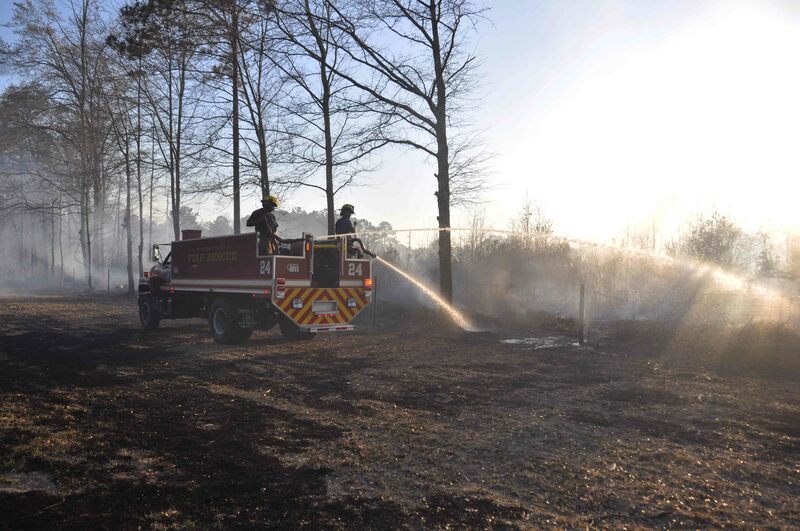 Engine 5 responded to a yard debris fire that spread into a wooded area near 9890 Augusta Highway Tuesday afternoon 22-March at 13:29. 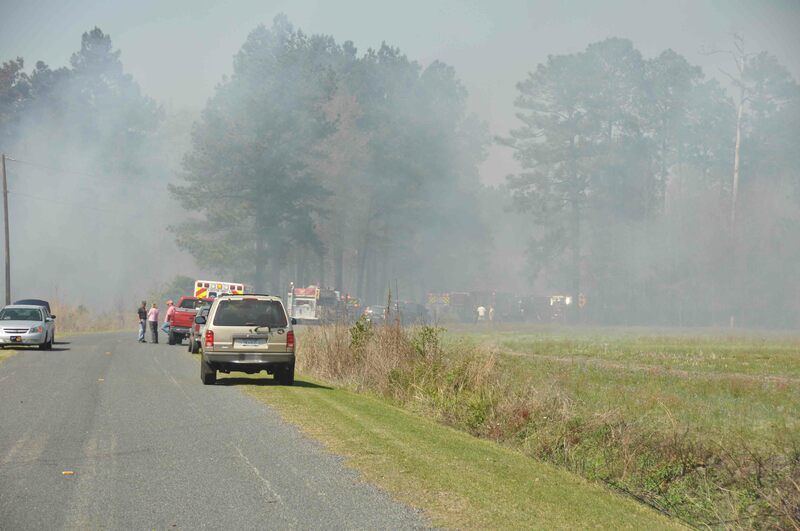 On arrival, firefighters found a rapidly spreading woods fire that was driven by 10 to 15 mile per winds. Additional units were requested as well as a tractor from the Forestry Commission. The fire began crowning as it progressed through the woods...click here for additional information. 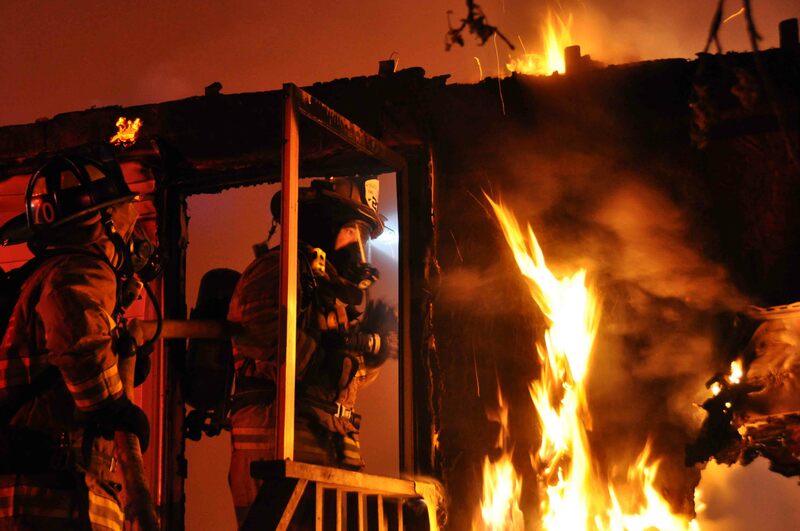 A home was destroyed in an early morning fire at 872 Buffalo Lane, Monday morning 21-March at 12:16 AM. Engine 19 located approximately 1 mile from the scene, arrived minutes after the dispatch to find half of the singlewide mobile home had already been destroyed and about half of the remaining structure was well involved. Click here for additional information. 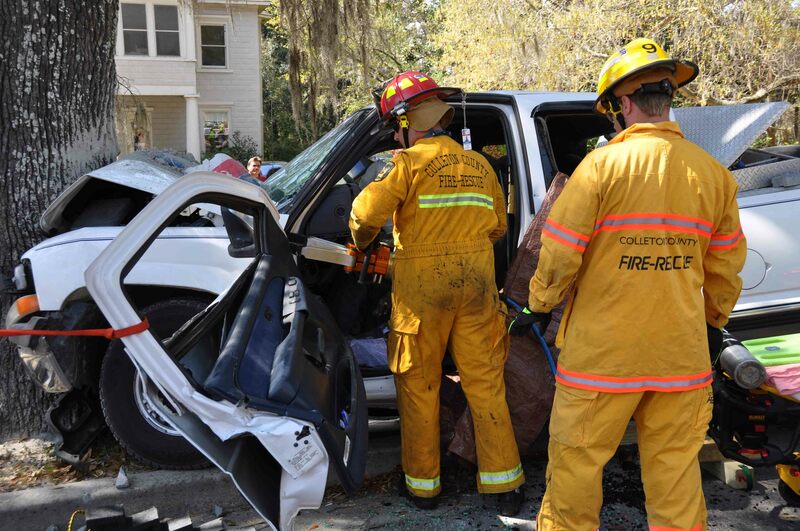 A two car collision has left one woman with fatal injuries and sent a man to Colleton Medical Center with traumatic injuries. The accident was reported at 21:16, Sunday evening 20-March. Apparently a Chevrolet pickup stuck a small car in the passenger side doors causing both vehicles to go down a 12 foot embankment. The small car came to rest on the passenger side trapping both occupants. Click here for additional information. 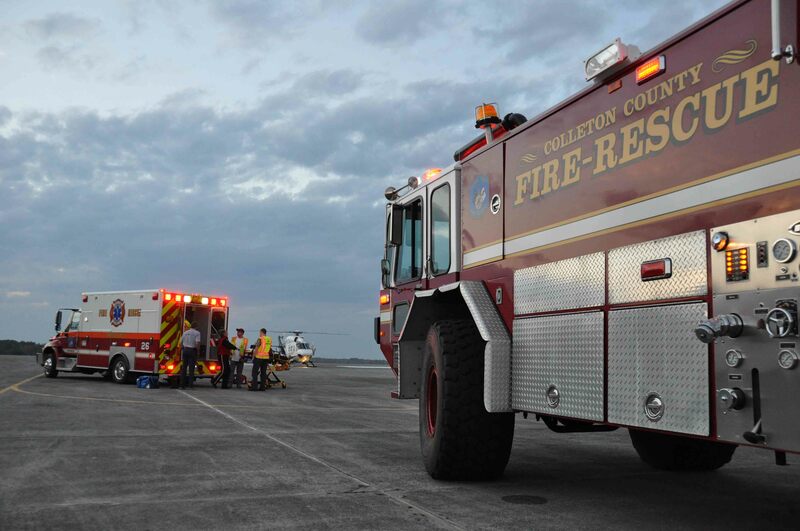 Colleton Firefighters collected $1,645 dollars for the Carolina Children’s Charity Saturday morning at the Wal-Mart parking lot before they had to stop due to a structure fire. The public was very supported of the project with the funds being collected in less than four hours. The local effort was coordinated by Battalion Chief Barb, who took the funds to Channel 2’s studio for the annual telethon. A vacant Jordan Lane structure received heavy fire damage during an incident north of the Town of Smoaks Sunday morning, 20-March at 01:08. 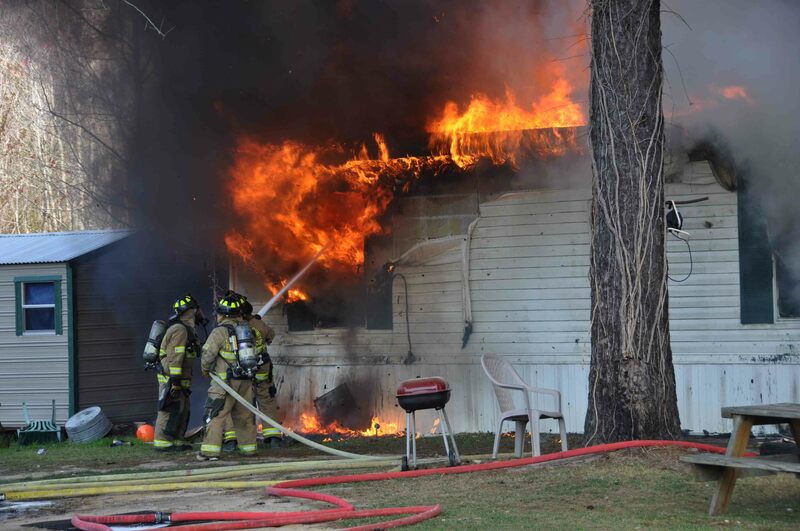 The fire was received simultaneously with a house fire on the other side of the county near Cottageville. Engine 18 arrived to find fire visible in an addition which had spread inside of the older model singlewide mobile home. Click here for additional information. 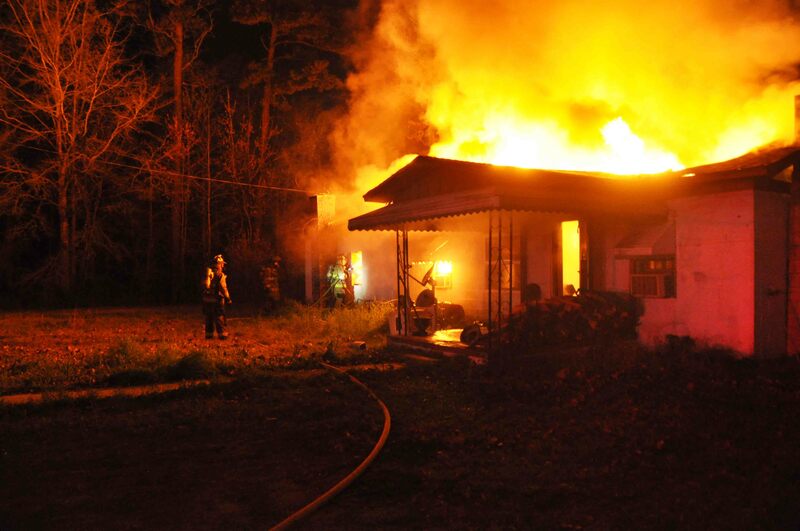 A structure fire at 14941 Cottageville Hwy was one of two structure fires reported at 01:07, Sunday morning 20-March. 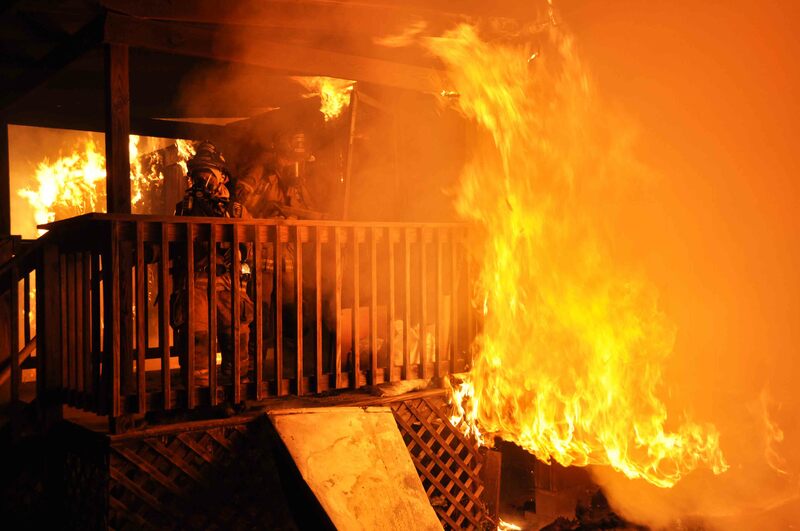 The fires were received at 9-1-1 simultaneously. In the Cottageville incident, the caller reported hearing noises and upon investigating found a room at the rear of the home well involved. Engine 9, Tender 9 and Medic 9 arrived minutes later to find the single story block structure well involved...click here for more information. 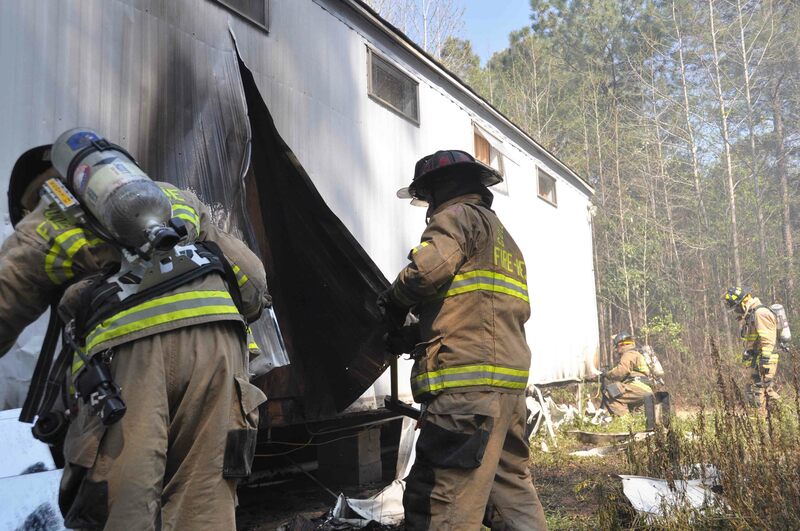 A mid afternoon structure fire has displaced a Can City Road family. The fire was reported by a neighbor at 14:19 Saturday 19-March at 5096 Can City Road. 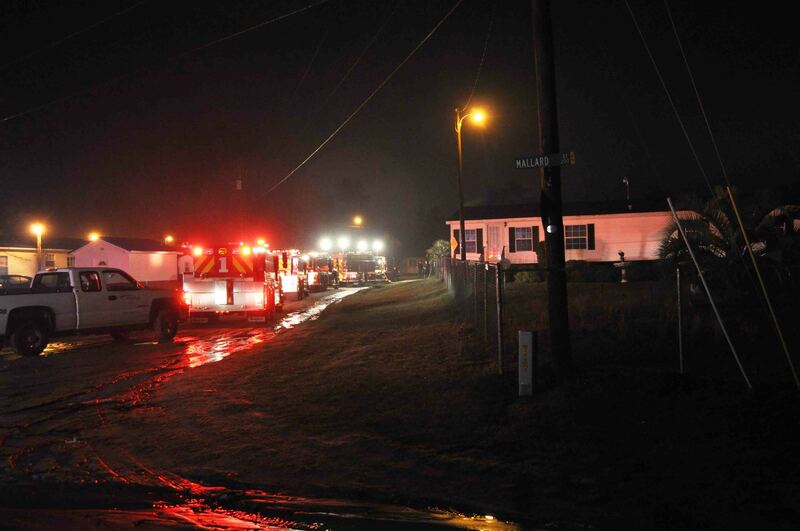 The caller reported smoke and fire coming from the roof of the mobile home. Responding Firefighters could see a thick black column of smoke five miles from the scene. Engine 26 arrived to find heavy fire conditions in the doublewide mobile home..click here for additional information. 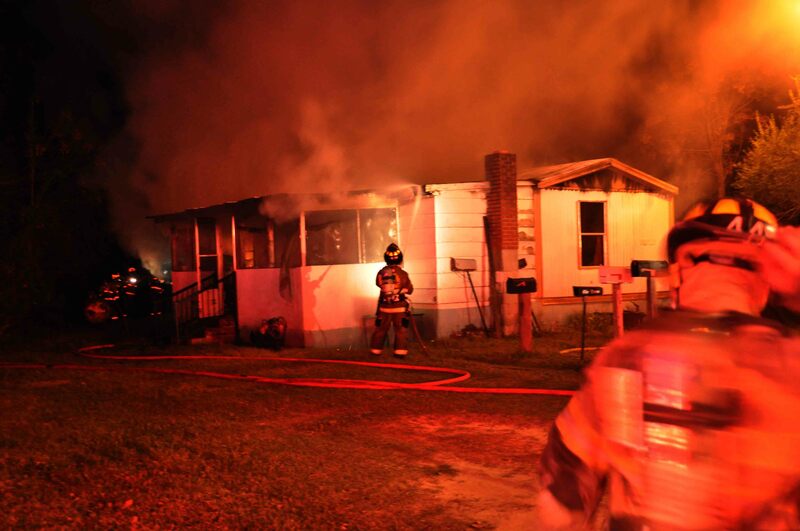 A Jonesville family lost their home in an early morning fire Saturday 19-March at 05:09. A neighbor alerted 9-1-1 Operators to the fire at 99 Frogtown Lane, reporting fire coming from the roof of the building. Engine 8 arrived to find the doublewide mobile home about 70% involved. The family was on vacation and was not at home at the time of the fire. Engine 8 used the deck gun to knock down the flames....click here for additional information. 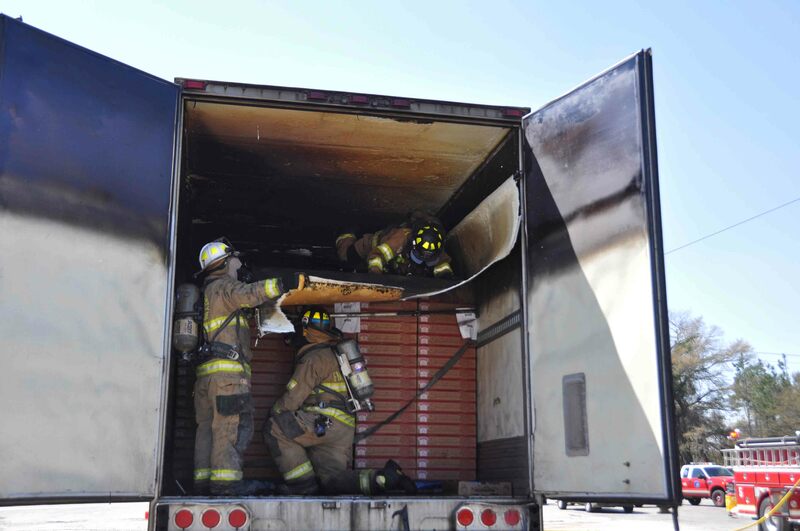 Stations 5, 17, 19 and 26 responded to a tractor trailer fire at Circle C Truck Stop located at 11109 Augusta Hwy Thursday afternoon 17-March at 12:59. Engine 5 arrived to find the front refrigeration unit on the produce trailer well involved. Heavy black smoke was coming from the roof and rear of the trailer as well. Additional fire units were requested. Click here for additional information. 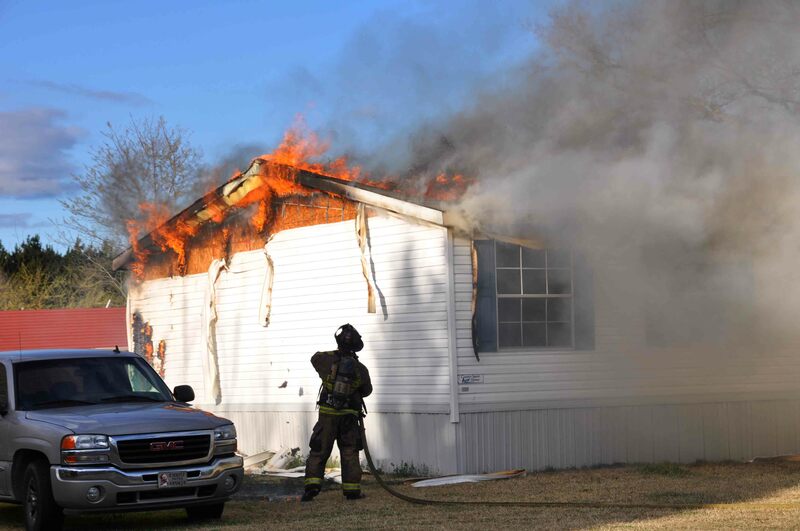 Multiple units responded to a reported structure fire at 79 Martin Farm Lane Tuesday afternoon 15-March at 14:54. Engine 26 arrived to find a fast moving grass/woods fire that burned a small metal outdoor building, burned a pile of debris, damaged a camper and was endangering a singlewide mobile home. Firefighters deployed multiple handlines to head off the fire and protect the camper and mobile home. Click here for more information. An out of control yard fire resulted in damage to a mobile home and a 10x10 outdoor storage building Monday 14-March at 15:10. 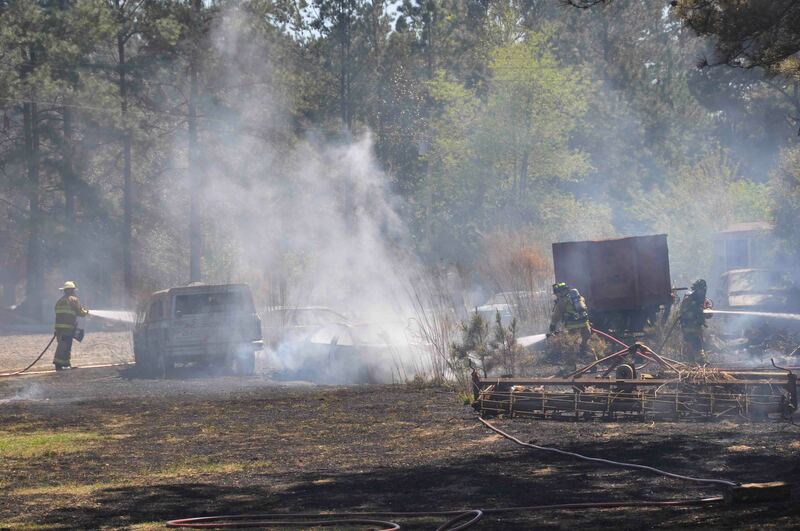 Firefighters were called to a residence located at 67 Oleander Court north of Walterboro for a report of a yard fire that was spreading fast. They arrived to find a fast moving fire that had already reached a nearby wooded area, circled a singlewide mobile home and storage building. Click here for more info. A 25 year old man was seriously injured when his motorcycle collided with a car near the intersection of Dandridge Road and Hubbard Street. According to witnesses, the motorcycle driver was thrown from his bike and struck a metal fence. He was not wearing a helmet. Medic 26 and Engine 26 arrived to find the man lying in the ditch near the fence. He suffered a suspected head injury and other traumatic injuries. Click here for more information. The National Volunteer Fire Council has established a relief fund to help the Japan Firefighters Association with the relief and recovery efforts after the tragic earthquake and tsunami. All money raised goes directly to the Japan Firefighters Association. The direct link to the fund on our web site is: http://www.nvfc.org/support/international-relief-fund. There is also a prominent link on the homepage of our web site at www.nvfc.org. We wish to offer condolences to Firefighter-EMT Tony Keen and his family. Tony’s grandmother who lives in Bristol West Virginia passed away Sunday evening. Arrangements have yet to be finalized. Tony and his family will be travelling to West Virginia for the funeral. Please keep his family in your prayers. Stations 2 and 12 responded to a report of a vehicle fire at 9291 Charleston Hwy, Sunday afternoon 13-March at 15:38. Engine 12 arrived to find a fully involved pickup truck, a small Cessna plane burning and a fast moving grass fire endangering a house, storage building and several pieces of personal property. Engine 12 deployed two handlines to combat the fires. Click here for additional information. 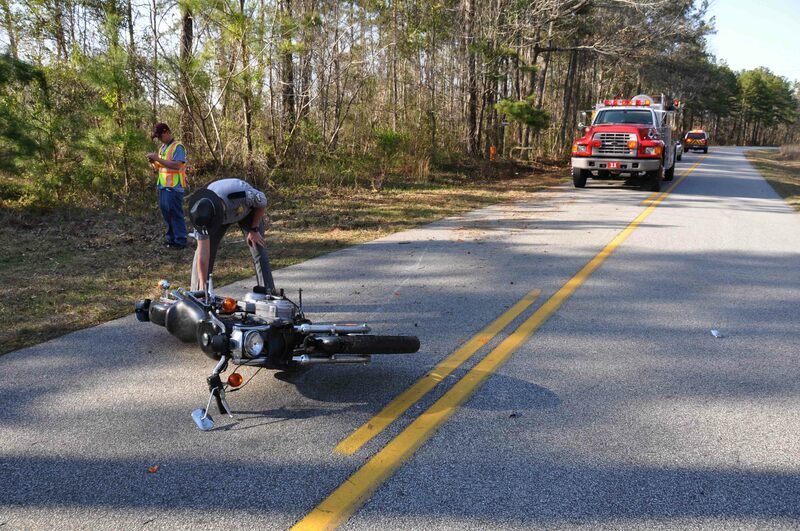 The SC Highway Patrol is investigating a fatal single vehicle motorcycle accident that occurred in the 4800 block of Peirce Road north of Cottageville Sunday afternoon 13-March. The accident was reported at 4:53 PM. Firefighter-Paramedics on Engine 9 and Medic 9 arrived to find the adult male driver of the motorcycle lying unconscious on the shoulder of the road. Click here for additional information. 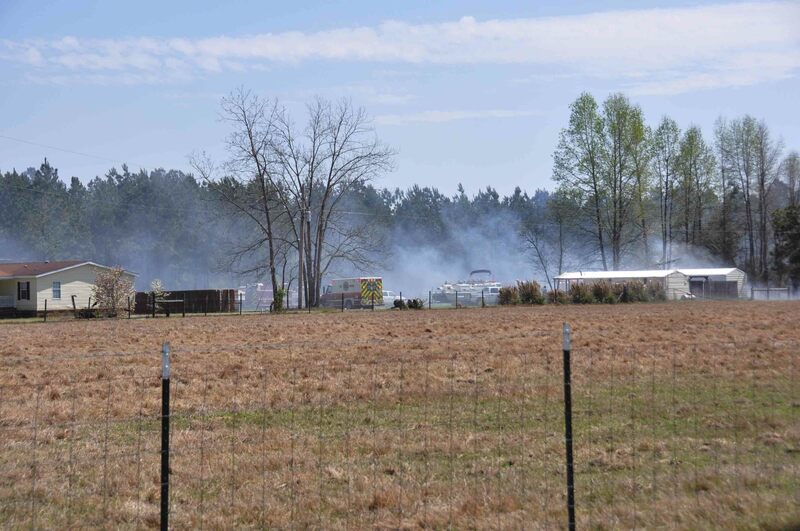 The SC Forestry Commission is investigating three possible arson fires that occurred on Barracada Road Sunday 13-March. The first fire was set on the shoulder of the road in the 2500 block, but was spotted and reported by a passerby a little after 11:00 AM. Engine 19 arrived quickly and stopped the fast moving fire just as it reached a building. At 4:37 PM, E-19 was again called to respond to the 900 block of Barracada Road. Click here for more info. Thirty years worth of Islandton Firefighters from Stations 10 and 15 celebrated three decades of operation Saturday evening 12-March beginning at 18:30. The crowd of past and present volunteer firefighters and family members began arriving at 18:30, bringing many handmade desserts to compliment the two hogs that the current staff had been cooking all day. Click here for additional information. The Tactical Response Team Training scheduled for Saturday, April 23, 2011 has been cancelled. We wish to congratulate Assistant Chief David Greene on obtaining Chief Fire Officer (CFO) Designation from the Commission of Professional Credentialing (CPC). 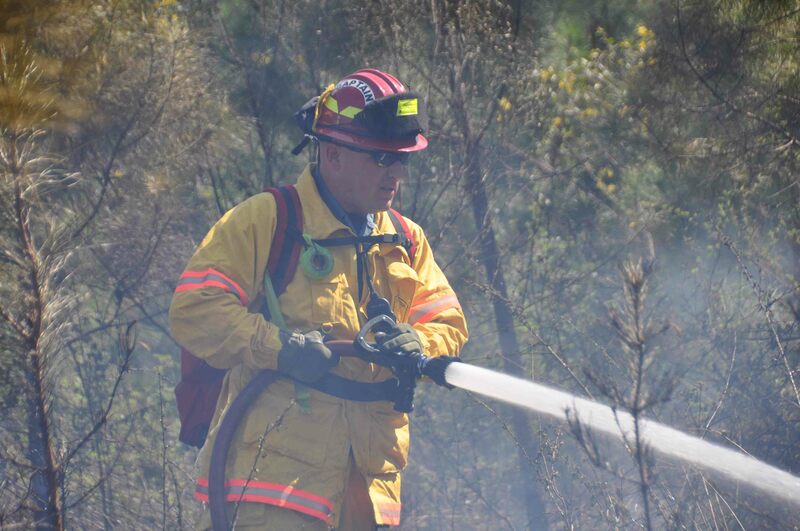 The CPC noted that Chief Greene is the ninth person to receive this honorific designation in South Carolina, joining just over 600 Fire Service Professionals nationwide. Click here for additional information. Firefighter-Paramedic Kevin Binnall, wishes to thank everyone for their thoughts and prayers. He has provided the following information regarding the funeral services for his mother. The Wake will be held at Brasco Funeral home,774 Moody Street Waltham Mass , 02454 from 4P - 8P. A memorial service will be conducted Saturday morning starting at 10A. Click here for additional information. 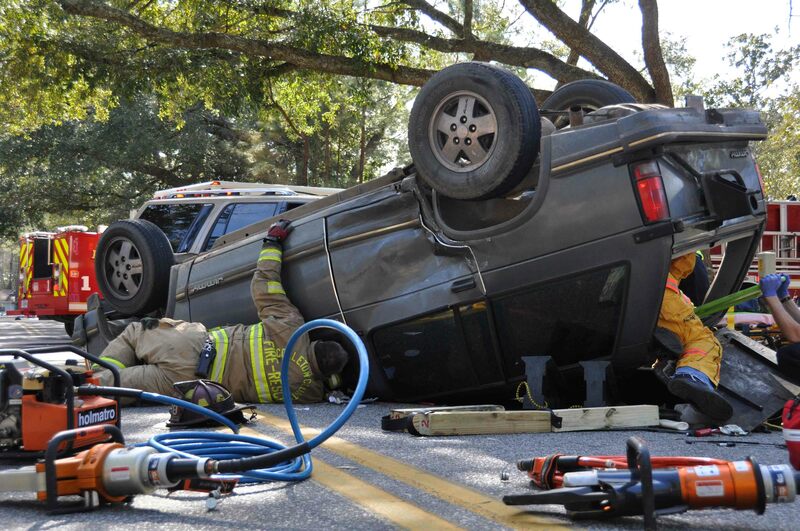 Stations 1 and 26 responded as mutual aid to the City of Walterboro Public Safety Department to extricate a patient from an over-turned vehicle. The accident occurred at the intersection of Forest Hills Road and Ireland Hills Drive Tuesday afternoon 8-March at 14:50. A small Chevrolet S-10 Blazer was struck in the side by a full size Lincoln Navigator causing the small SUV to overturn trapping the front seat passenger.Click here for more info. 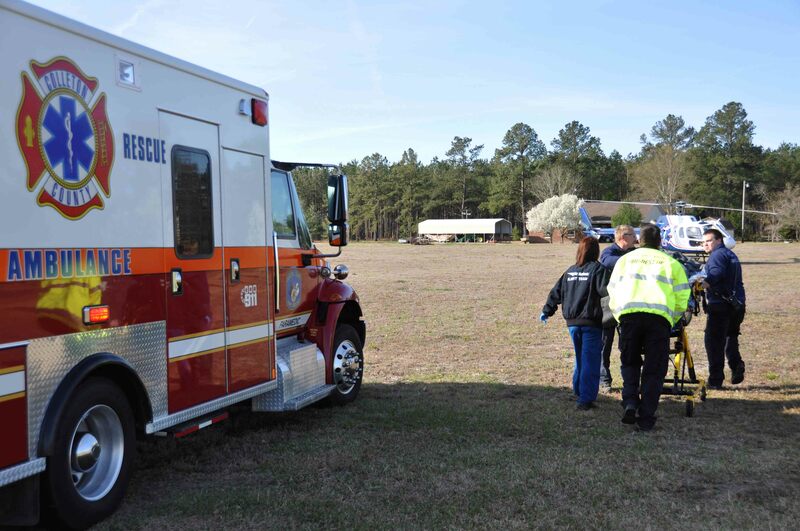 Multiple units responded to a single vehicle high speed MVC at the intersection of Cayce Road and Willow Swamp Road Monday morning 07-March at 08:09. Apparently a northbound Ford Expedition failed to negotiate a curve, entered the ditch and struck the south side of the intersecting roadbed. The vehicle appeared to have become airborne, jumped Willow Swamp Road, striking a tree before landing upright in a wooded area on the north side of the road. Click here for additional information. A single car MVC on Interstate 95 at the 58 mile marker southbound as sent two people to area hospitals. The accident was reported at 18:13 after a southbound Chevrolet Envoy suffered a blowout. The vehicle lost control, went off the right shoulder and overturned at least once ejecting a female occupant. Two other people were also in the vehicle. Click here for additional information. SLED is assisting in the investigation of a suspicious residential fire at 603 Freeman Lane. 9-1-1 operators received several reports of the fire advising the building was well involved. Engine 9 and Medic 9 arrived to find the building with heavy fire conditions on the “B” side of the structure with the roof already collapsed on that end of the building. Click here for additional information. 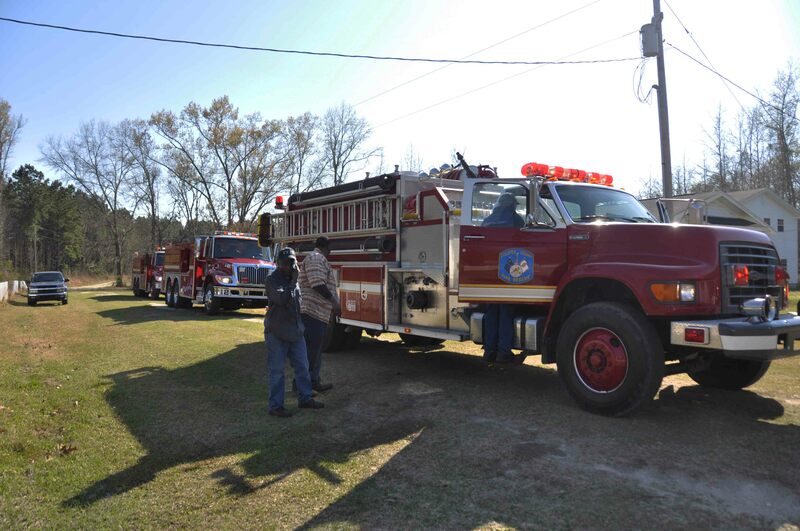 A three day Fire Department Training Network RIT Class was held at the Saint Andrews Fire Department (Charleston County) over the weekend, with the third day being conducted at the Breland Building in Walterboro. 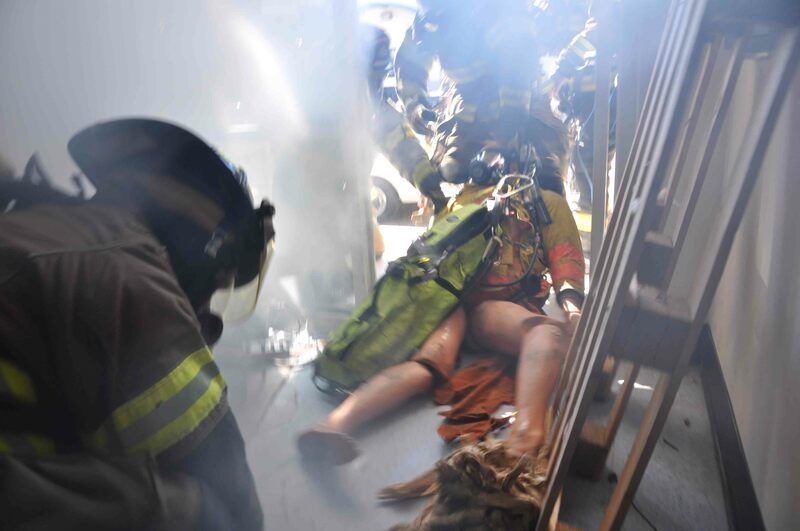 Charleston Area firefighters along with local firefighters Ben Rice and Brian Drew spend the first two days learning from the intense training exercises designed to teach firefighters how to rescue down or trapped comrades. Click here for additional information. We wish to offer condolences to Firefighter-Paramedic Kevin Binnall and his family. Kevin’s mother who lives in Massachusetts passed away suddenly Sunday morning. Arrangements have yet to be finalized. Kevin and his family will be travelling to Massachusetts for the funeral. Please keep his family in your prayers. We wish to offer condolences to Station # 7 Lieutenant David Sauls and his wife Janice. Janice’s mother Suzie Stringfield of Possum Corner Road passed away Friday after a long illness. Services were conducted by Parker-Rhoden Funeral Home. Please keep their family in your prayers. A Round O Community family was displaced following a late night house fire at 59 Perk Lane Friday evening 4-March at 23:46. Engine 9 arrived to find the singlewide mobile home fully involved. The house was located at the dead end of the one lane dirt road, making access to the residence difficult. Firefighters deployed two 1-3/4 handlines to combat the fire. Click here for additional information. 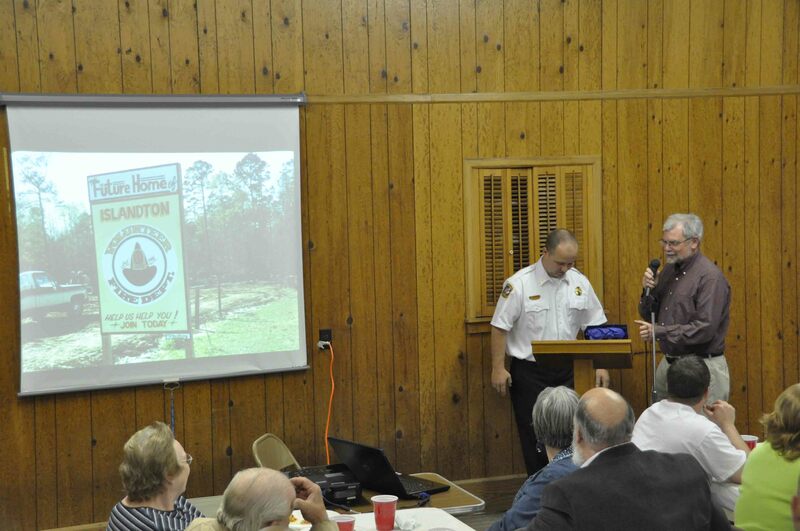 Chief Sam Brockington of the South Lynches Fire Department and Chief Baker will be presenting a power point and providing some instruction on rural water supply on Friday, March 11th at 10:30 am at the Edisto Beach Fire Station (Station # 14, 2425 Murray Street, Edisto Island). The class is open to anyone who wishes to attend. Please contact Chief Waddle at 843-869-2506, Extension # 2, for confirmation and /or additional information. A female patient suffered a sudden and acute medical emergency at a residence on Wesley Grove Road Tuesday evening 01-March at 18:49. Medic 19 arrived to find the woman unconscious and in critical condition. 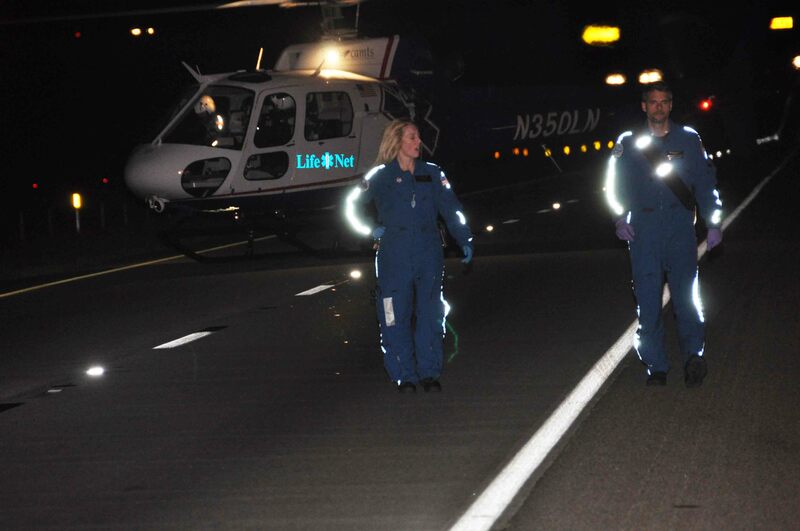 A medical helicopter was requested to rapidly transport the patient to the Stroke Center at MUSC in Charleston. Click here for additional information. 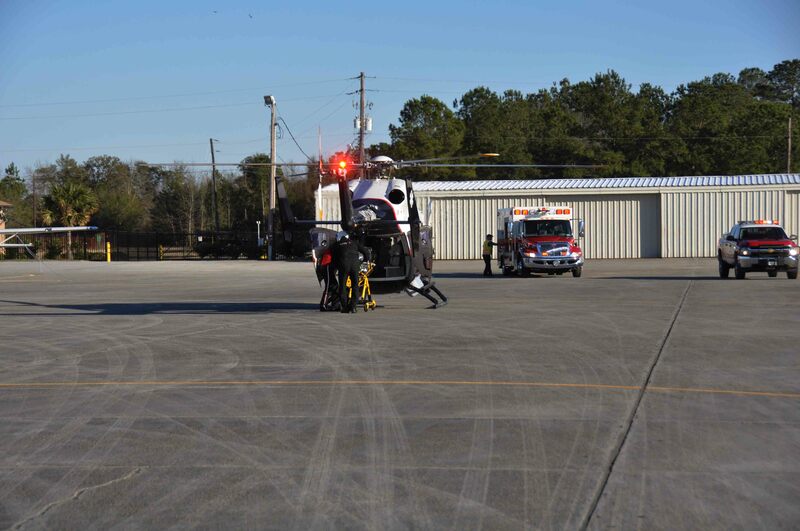 A 41 year old male was air lifted to the Trauma Center at MUSC Tuesday 1-March at 16:05, after receiving multiple traumatic injuries in a MVC. Engine 16 and Medic 26 arrived at the intersection of Heirs Corner Road and Railroad Street to find a motorcycle had collided with a passenger car. 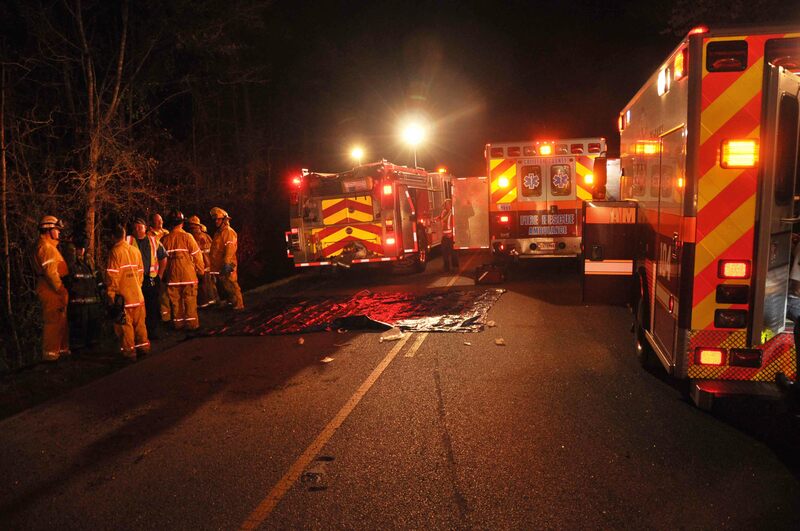 The male patient was lying in the roadway with several apparent injuries. Click here for additional information.